Want to create daily consistency with your baby? Discover how a newborn schedule based on babies’ rhythms, feedings, and sleep can help them adjust to life outside the womb. As any new mom can tell you, babies do things on their own terms. Forget long stretches of sleep—they’ll gladly sleep in spurts, waking up periodically to eat. Peeing and pooping happen at all hours, no matter how inconvenient to clean. And days and nights are mixed together, with no structure in place. Unfortunately for any sleep-deprived, exasperated parent, this is all normal, and for so many reasons. Babies don’t have the proper digestive systems in place yet to process food the way you and I (or even older kids) do. Their tummies are smaller and can only take so much. And they slept snuggled in your womb for months, oblivious to our schedules and routines. That’s why you end up with babies who sleep well during the day but at night wake up every hour and a half. Or perhaps your baby sleeps so much you wonder whether he should be awake or more alert longer. Still at other times, it takes ages to get him to fall asleep, only for him to wake up minutes later. Before you write off the newborn stage as hopeless, rest assured you can still help your baby adjust to life outside the womb. And it all happens with establishing a newborn schedule. Now, this isn’t the kind of “schedule” you might use for yourself. We’re not talking about sticking to the clock, or expecting your baby to abide by your schedule no matter what. In the womb, your baby only knew one environment, with no idea whether the rest of the world was asleep or awake. Out in the world however, you can help him sleep longer at night and stay more awake in the day by the activities you do. When he wakes up throughout the night, stick to feedings and diaper changes only. As alert as he might try to be, don’t engage in play at this time, so that he can learn to sleep in longer stretches. You don’t have to be “cold” (you can still look him in the eyes!) but keep your body language soft and subdued. Meanwhile, use the daytime to encourage play and attentiveness. This is when you can coo and smile, sing songs, and keep your environment bright. He’ll then begin to associate daytime with being awake and alert, and nighttime with being dark and subdued. With a newborn, don’t base your activities by the clock, but rather on a general flow to your day. One of the best ways to establish this rhythm is to feed your baby after waking up. In Secrets of the Baby Whisperer, Tracy Hogg talks about the “E-A-S-Y” routine, which stands for “eat, awake, sleep, and you” (with “you” being time to yourself while the baby sleeps). Once your baby is awake for the day, you’d then feed him, followed by awake time. After he’s been awake some time, then it’s back to sleep, followed by eating, and so forth. A newborn schedule is less about following a strict timeline as it is about following a general flow to your day. That said, two time frames I do recommend you stick to are bedtime and wake up time. Try to put your newborn down to sleep for the night at the same time every night, even if you have to adjust the activities beforehand. Similarly, have the same “official” wake up time every morning. A consistent bedtime allows him to get used to falling asleep at the same time every night. You also benefit from putting your baby down at the same time each night, having one less thing to think about. Find ways to adjust your early evening activities so you can put your baby down to sleep by bedtime. Meanwhile, start your day at the same time each morning, regardless of when your baby wakes up. Typically, the newborn stage means we’re up much earlier than we ever were before kids, so you might have a 6am start to your day. That means that if your baby is ready to go at 4am, continue to keep your environment subdued for the next two hours until wake up time. Just as you have a general flow to your day to help your baby know what to expect, so too should you have a bedtime routine. A bedtime routine doesn’t have to be fancy—think of it as doing the same things in the same order every day. Maybe that means starting with a soothing bath at 6:45pm, followed by a baby massage and changing into pajamas. You’d then read a few books in bed, nurse the baby, and put him down to bed by 7:30pm. Bath, massage, pajamas, books, feeding, bed. Same order, at the same time, every day. A bedtime routine lets your baby know which activities are coming up and provides a comforting familiarity when done consistently. Get tips on how to establish a baby nighttime routine. As much as we wish babies would always eat, play, and sleep in set hours of the day, that’s simply not how they function. In fact, you might have some days where they wake up, eat, stay awake for 10 minutes, and go right back to sleep. Or perhaps they’ll eat, only to want to eat more 30 minutes later. Such is life with a newborn. So, do what you can to get your baby onto a newborn schedule, but also be open to fidgeting with it, including feeding on demand. This means feeding your baby when he’s hungry, regardless of how long ago (or how recently!) he had just eaten. This is especially true if you’re breastfeeding, since your supply depends on your baby’s demand for it. Feeding on demand allows you to nurse frequently, especially in the first two weeks, to encourage milk production. 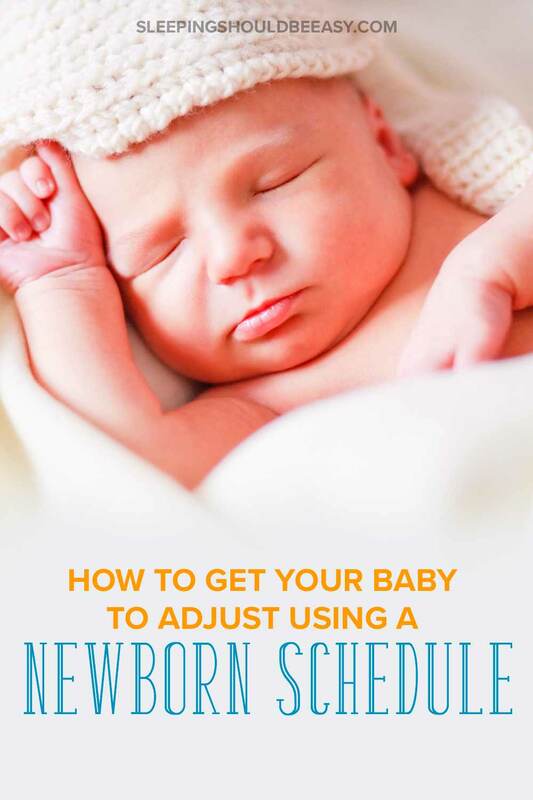 As you can see, a newborn schedule isn’t about getting your baby on a strict timeline. Instead, it’s about following a general flow to your day and abiding by simple hacks to help him better adjust. For instance, keep nighttime subdued, saving all your active play time for the day. Feed him after waking up so he’s more alert when awake (and less likely to need to feed to sleep). 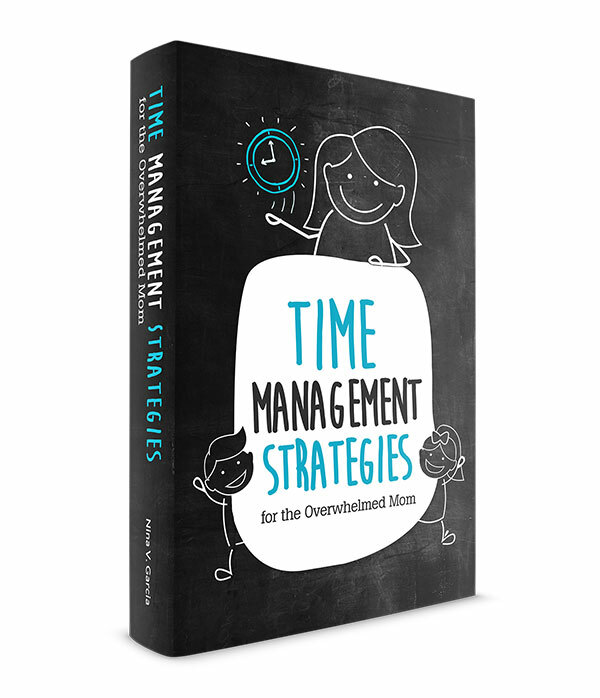 Create a bedtime routine so he can better transition into a long stretch of sleep. You also want to feed on demand, especially in the first two weeks, to keep your supply up and accommodate your baby’s frequent hunger. And while you can keep your timeline flexible, do try to stick to the same wake up and bedtimes every day. It may take a few more months to establish a set timeline for your baby. In the meantime, do your best to create a newborn schedule that works—even on your baby’s terms. When Do Newborns Get Easier? Tell me in the comments: what does your newborn schedule look like? 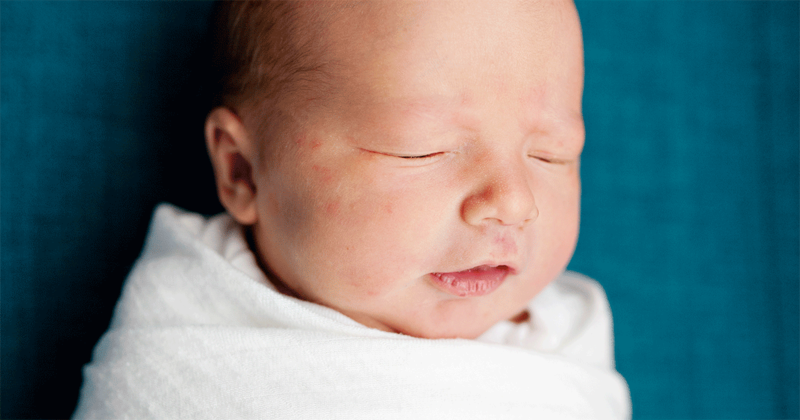 Did you know that your baby's awake time affects how well he sleeps? 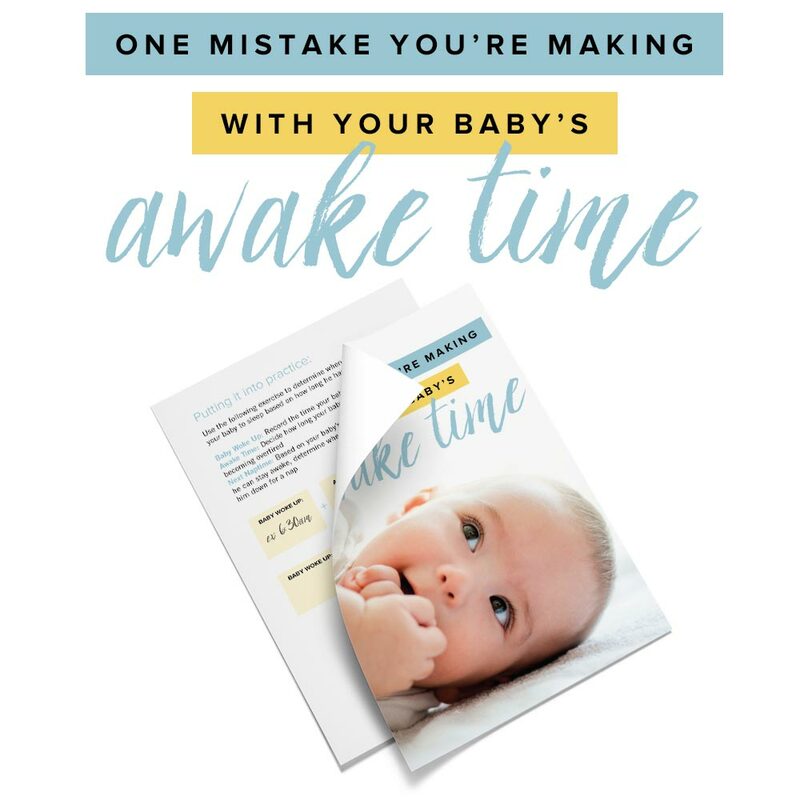 Discover one mistake you may be making with your baby's awake time. Don't make the same mistakes I did—help your baby fall asleep with this one simple trick! You absolutely need to get this one thing right in order to help your baby sleep well.